Be honest; how often do you use your mobile phone? If you’re anything like the average British person, it’s likely to be more than 10,000 times a year. Yes, that’s right; checking your phone’s screen in excess of 10,000 times across 365 days – that’s (if your arithmetic could do with a helping hand) 28 times every day. It’s worth mentioning because, whichever way you slice it, we use our phones a lot. And in using them a lot, we surf the Internet a great deal and, in doing that, we discover, upload and access applications a great deal. Out of those, say, 28 times a day you use your phone, how many of them are accessing an app? Why ask that particular question, you may ask? Well, let’s answer it by asking another. The next time you book a getaway somewhere, would you like to do so by the most easy-to-use, reliable and accessible way possible? Silly question – the answer’s obviously yes. The fact is then, should you be looking to spend your next short break in the dynamically diverse world-city that’s London, you shouldn’t be looking to spend hours sitting at your PC scrolling through Google search for hotel deals, you should be booking your accommodation swiftly, easily and securely via an app. It’s time to join the 21st Century when it comes to hotel bookings – it’s time to book your break via The Montcalm luxury hotels app. So, just what’s so great about The Montcalm app? First of all, it’s about the convenience. Wherever you are in the world, whatever the time of day (or night), you can use the app to browse through every one of the London-based Montcalm family of hotels; flicking through images of their interiors and exteriors, details of their amenities (including their restaurants, cocktail bars, bistros and traditional brasseries) and, of course, maps of their locations so you can check exactly where they are in the city in relation to major landmarks and sites of interest you’ll doubtless want to spend time visiting. 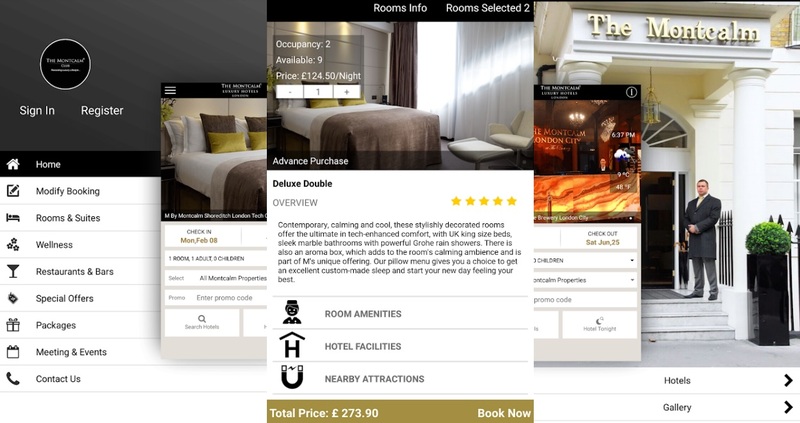 Our app has also been specifically designed to help users save money on their visit to London. How so? Because, via the app and, therefore, via your phone, you can receive updates on the very latest deals, special offers and seasonal packages on offer at our various properties – before anyone else. That means that, should you be considering coming to the UK capital for a getaway with that special someone of if you’re looking to book an unforgettable trip with your family in tow or, frankly, whatever the nature of your desired visit to the city, we’re bound to have a terrific package on the table, available to you via our app, to ensure you enjoy a timeless trip to London for a money-saving price. All in all then, the Montcalm app is a cost-effective, time-efficient and easy-to-navigate way to book a room in London; it’s the way of the future in accommodation booking – only it’s available right now!